I found the food trucks! | Musings of a marginally sane feline-appreciating female. Those of you in more urban/cosmopolitan/not-the-suburbs areas may be thinking, “So? 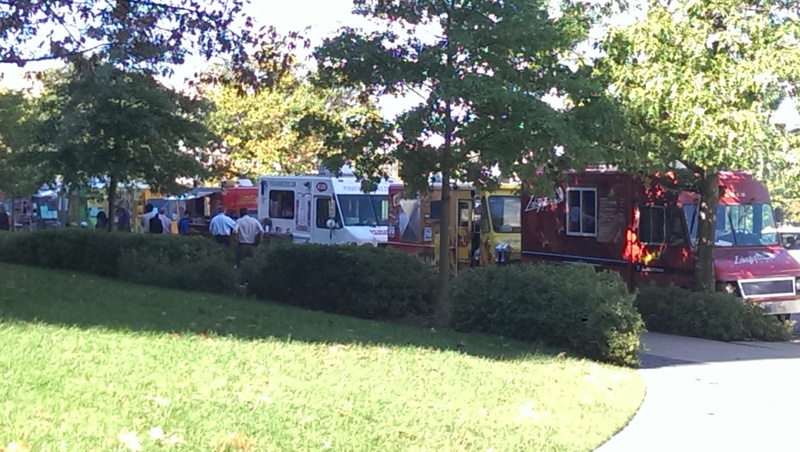 There are food trucks all over the place.” Yeah, not so much where I live. Sure, the county has finally given the green light for food truck operators to apply to sell at the park near my house, but I can’t say I blame the operators for not lining up to serve the Burke/Springfield badlands. Well, lunch was no longer a question, but a dizzying array of choices. I had time to peruse my options before I had to go to my appointment, and I found myself in lunch heaven. Cheesesteaks, tacos, pho (with a zombie theme), Indonesian, Indian, Peruvian, southern BBQ, Italian, lobster rolls, Ethopian, crepes, Greek, Halal, Jamaican, and a host of other options. Seriously, if you look through the 18 trucks (I counted) and could still not find something to eat for lunch – then you probably aren’t actually hungry – or you just can’t make a decision. 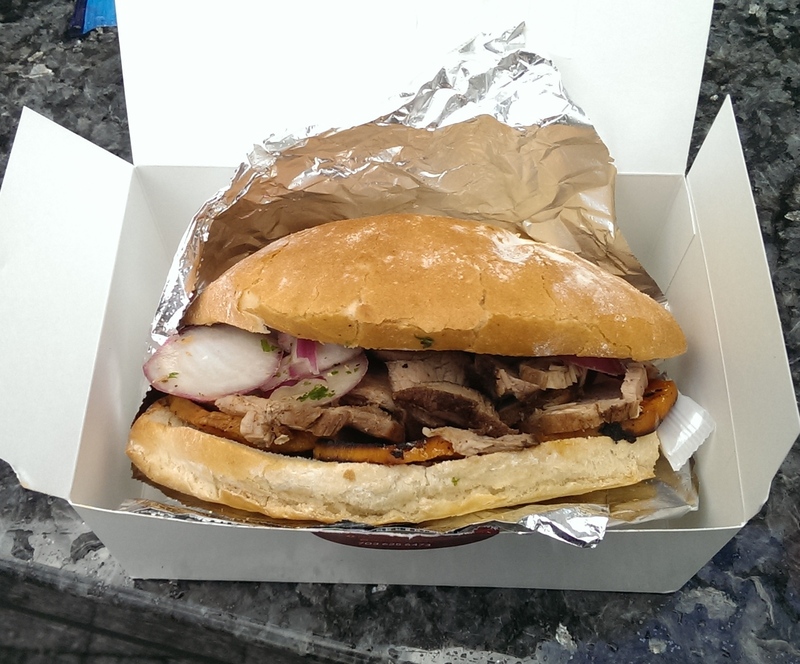 I settled on the pan con chicharrón from the Peruvian Brothers truck – and it was fantastic. I’m going to be up at L’Enfant Plaza twice a week for the next month and a half. If I want any chance of maintaining my current weight given all these lunch options, I’m going to have to start running again. And maybe throw in some pilates, yoga, and zumba to boot. What’s interesting to me is that I am old enough to remember when the only time you saw food trucks was at a constructions site – and even then it was the basics – hot dogs, chips, maybe hamburgers if it was a really ambitious truck. Today? You could send pretty much any homesick UN delegation to L’Enfant Plaza knowing they’d find something great to eat. Mobile food from everywhere FTW. This entry was posted in Food, Food Trucks, Happiness and tagged DC, Food, Food Trucks, Great Food, L'Enfant Plaza. Bookmark the permalink.